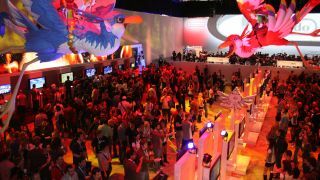 Was this the worst E3 ever? We don't want to be unkind, but it's safe to say that the current generation of games consoles is getting on a bit. Our Xbox 360s have grown long white beards, our PS3s keep going on about the war and we find ourselves getting up several times in the middle of the night for a Wii. Hurrah, then, for E3 2012, when the giants of games would show off their new systems! We all know that while Sony is working on the next PlayStation and Microsoft is working on a next-gen Xbox, they want to squeeze every last penny from the current generation - so while it was a bit disappointing, it wasn't a huge surprise when we didn't see even the slightest hint of an Xbox 720 or PS4 at E3. What was a surprise, though, was SmartGlass. SmartGlass is Microsoft's equivalent of Apple's AirPlay, enabling you to throw video from your mobile or tablet to your TV via your Xbox, but there's more to it than moving movies: SmartGlass enables your mobile device to act as a second screen, so for example it might be a controller or map screen for games, an information screen for the programme you're watching, or a way to control the Xbox 360's forthcoming web browser without having to use the standard controller. If we're honest, though, the rest of Microsoft's event was rather underwhelming. It's nice to see the Master Chief back again in Halo 4, of course, but with the honourable exception of South Park - whose creators mercilessly mocked SmartGlass, and pretty much everything else, during their own presentation - it was all a bit sequel-y. Even the big stuff, such as the new Xbox Music service, was rather "meh", probably because it's Zune with a new name, and we're curbing our enthusiasm for the various media deals Microsoft announced until we discover which ones actually make it to the UK. It was a similar story with Sony. While there were some cool new games - The Last of Us and Watch Dogs look superb, and it'll be fascinating to see the Eve Online shooter Dust 514 - the line-up is similarly samey. Some observers have suggested that the heavy emphasis on sequels to existing titles is because developers have their best people locked away in darkened rooms with Xbox 720 and PS4 dev kits. Still, the Storyteller ebook service is interesting, and Resistance: Burning Skies on the PS Vita should delight the six or seven people who've bought Sony's handheld so far. At least Nintendo showed us some new hardware. Yes, it was the same hardware it showed us last year, but, hey! It's been slightly redesigned! Not only that, but there's some genuinely interesting stuff lined up for the Wii U launch: Batman Arkham City Armored Edition, Aliens Colonial Marines, Tekken Tag Tournament and so on. As you'd expect, there will also be a cute Nintendo game to help new customers get to grips with the controller: for the Wii U that game will be NintendoLand. We're fascinated by the Wii U, not least because it offers a SmartGlass-esque twin-screen setup (and of course, it got there before Microsoft did). In an interesting bit of role reversal, while games console firms emphasised the non-gaming, TV and film-related sides of their products, elsewhere at E3 TV manufacturers were emphasising games: in particular, cloud gaming. OnLive has inked a big deal with LG to have the service on G2 series TVs, while Samsung is going to offer a Samsung-branded cloud gaming service powered by Gaikai. There's another cloud (no pun intended) on the consoles' horizon: Apple, whose Apple TV is likely to get an update next week. iOS gaming is already a huge market and Apple seems set to take its "hobby" more seriously. The next generation of consoles won't just be competing against one another, but against Apple TVs, Android tablets and cloud-connected gaming TVs.